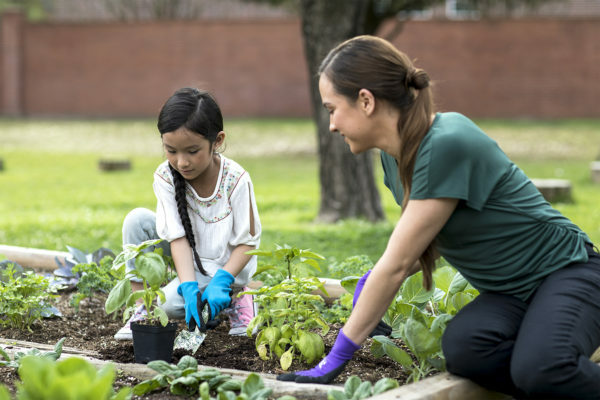 The Children’s Courtyard and her sister schools at the Learning Care Group are reaffirming their commitment with the Partnership for a Healthier America (PHA) and introducing new nutrition, fitness and gardening initiatives that further enhance the company’s Grow Fit culture. The new agreement, announced today at the PHA’s Building a Healthier Future Summit, builds upon the early education provider’s leadership in creating a healthy learning environment and inspiring children to make smart choices. Learning Care Group joined the PHA in February 2014 and is on track to meet its criteria aligning with the Let’s Move! Childcare goals regarding physical activity, food, beverages, infant feeding, screen time and parent engagement. Under a renewed three-year agreement, Learning Care Group pledges to continue achieving all of these standards to help prevent childhood obesity and avoid chronic disease later in life. The new commitment will positively impact 130,000 children attending its schools nationwide, including: Childtime, The Children’s Courtyard, Creative Kids Learning Centers, Everbrook Academy, La Petite Academy, Montessori Unlimited and Tutor Time. Nutrition: At every Learning Care Group school, healthy nutrition habits are emphasized during each meal – including the importance of drinking water and following appropriate portion sizes. Created by a registered dietician nutritionist, the company’s Grow Fit menu now offers over 50 fruits and vegetables, lean proteins, more than 30 multi-cultural offerings, and more than 30 whole grain options. Having already eliminated all fried foods and juice from the Grow Fit menu, Learning Care Group will now convert the remaining non-whole grain offerings to whole grain within the next year. It will also eliminate all grain-based desserts from the menu, further reducing consumption of sugar and saturated fats. Fitness: Physical activity is an essential part of every school day throughout Learning Care Group. The company is now further augmenting its physical fitness curriculum with new guided activities for indoor and outdoor play. Using the company’s proprietary Learning Care System, teachers will assess progress and create customized lesson plans to meet each child’s fitness needs while ensuring age-appropriate progress in physical development and health. Garden Program: In keeping with its emphasis on STEM and STEAM learning, the company is developing a Grow Fit Gardening Program that will be available to all its schools. The program will have scalable options for both outdoor and indoor gardens, with hands-on learning opportunities for preschoolers and school-agers alike.